The Maruti Alto was quite a fun car to drive when it was launched initially in the year 2000, especially the version that came fitted with the 1.1-litre engine. It wasn’t monstrously fast, but it was peppy and felt playful. Since then, the Alto has had many updates and in its current form, it is more of a practical, entry-level hatchback which isn’t as charming as it used to be. But this maroon example from West Bengal wants the older version’s legacy to live on and how! 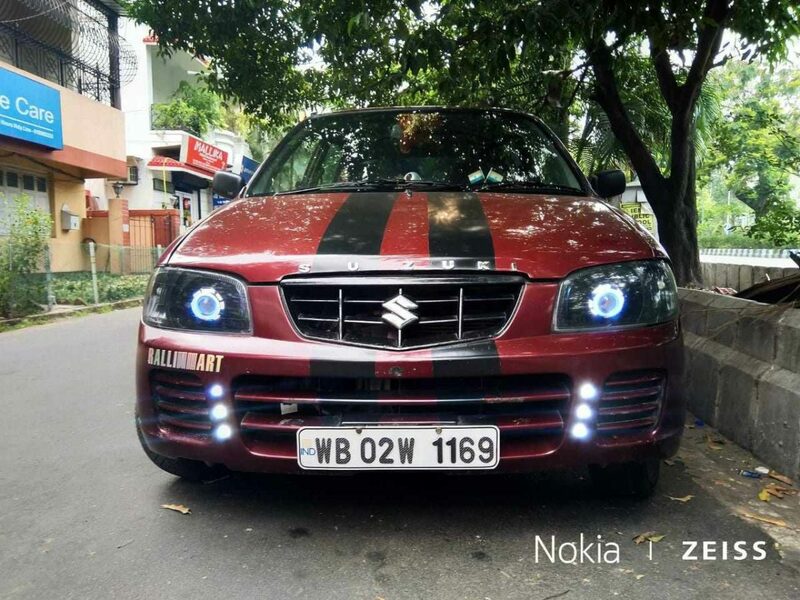 This modified Maruti Alto is capable of hitting the 200 km/h mark and can sprint from 0 – 100 km/h in 8.1 seconds! That’s faster than all the hot/warm hatchbacks we’ve had in our market, including the Punto Abarth and everything else in that ballpark. How has such performance been achieved from something as humble as an Alto? It runs a standalone ECU which works in conjunction with a custom-made freeflow exhaust, custom air intake, high-lift camshafts by HKS, ported and polished intake manifolds, exhaust manifolds and piston heads! How many horses now gallop towards the front axle is not known, however, we’re sure the gains are pretty substantial and to control all that, this Alto now runs on Yokohama 185/60, 13″ rubber. However, there are no updates for the suspension, which would’ve otherwise helped this Alto behave better and this fast little thing still runs on steel wheels! However, for being a lightweight little car, we’d be hoping that the rear roof-mounted spoiler works to keep things on the ground. What else has changed? The car has been fitted with a Momo three-spoke steering wheel, along with a gear knob and pedals. Don’t miss the faux-carbon treatment around the instrument cluster and the centre console. We’re sure those custom pipes sound nice, but there’s also a Sony sound system which has been paired with a 12″ Subwoofer and is rated for 3800 watts of peak power. To get them shifts right, there’s also a two-stage tachometer installed next to the driver-side A-pillar. On the outside, there are plenty of RalliArt and some more stickers, the illuminators have been smoked and black striping in the centre confirms this Alto’s go-fast intent. What would’ve made it tastier is some new paint and better wheels and suspension to match all the performance. But we’re sure those religious idols inside do help. Because we’re almost certain that after hitting a certain speed, this thing tests courage.